O’Devaney Gardens was supposed to be a model for fixing an area plagued with problems – but it all went wrong. AFTER MORE THAN 15 years of promises, plans to redevelop O’Devaney Gardens, the decaying social housing complex off Dublin’s North Circular Road which had become a byword for bad planning and anti-social behaviour, have officially been put on hold. It was confirmed at a meeting this week that the ambitious plan to regenerate the flat complex will not be going ahead for the forseeable future due to lack of money – with one person with knowledge of the situation estimating that it could be 15 years before work starts again on the site. “There just isn’t the money there to fund the regeneration. You can’t build half houses,” said local councillor Padraig McLoughlin. Most of the people living in O’Devaney Gardens had already been moved to temporary accommodation in anticipation of the development being completed. The 44 families remaining in the flats – originally 278 flats over 13 four-storey blocks – will be gradually rehoused by Dublin City Council and the blocks will be demolished over the next five years. The Council had planned to build a whole new complex, including courtyards, sports pitch, low-rise housing and green spaces. The plan to rebuilt the flats was hit by the double whammy of bad timing and bad luck. Dublin City Council and property developer Bernard McNamara agreed a public-private partnership with both sides helping to fund a regeneration of the problem-hit complex, as well as four other estates in Dublin’s inner city. However the agreement collapsed in May 2008 when McNamara pulled out as his finances crashed with the property market. Dublin City Council attempted to struggle on without money from a private investor and had said that it would rebuild the estate with social housing – without private or affordable housing – over an estimated 10 years, starting in 2014 at the earliest. However that plan too has now collapsed. People living in the area are still optimistic that the site could be used for communal good rather than fall into disrepair. ”Now it’s about getting community use out of it if we can’t get housing use out of it,” said Padraig McLoughlin. It will be some time before plans are finalised but there are discussions about using the space as allotments, sports grounds, or community gardens. Background – What went wrong at O’Devaney Gardens? 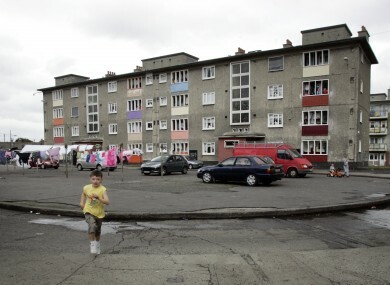 When O’Devaney Gardens was built in the 1950s, it was seen as a progressive way to deal with Dublin’s housing problem. Local authorities were finally taking responsibility for slums and tenements in which many working-class Dubliners lived by building modern high-rise flats, capable of housing families. The complex on a 16-acre plot near the Phoenix Park was supposed to be a mixture of social housing provided by Dublin Corporation (as it was called at the time) and private tenants in a kind of early public-private partnership. Ironically, the same problem that hit the development in the 2000s also struck in the 1950s: the private developer involved went bankrupt, leaving Dublin Corporation (now Dublin City Council) to pick up the pieces. The Corporation took over the private flats (known as the “luxuries” by residents), meaning the entire sprawling complex was used solely for social housing. The problems began soon afterwards. The apartments were small, with few facilities in the area, and residents, community groups and local representatives repeatedly asked for something to be done. A Dáil debate from 1969 records Richard Gogan, a Fianna Fáil TD for the area, asking the Minister for Local Government if Dublin Corporation would provide a community centre and playground for the children in the complex. The Minister said a playground was planned to be built “over the next five years”. A Dáil debate in 1981 noted that there were barely any facilities built in the area for the large numbers of families living there. Six years later in 1987, local TD Michael Keating told the Dáil about the reported serious drug problem in O’Devaney Gardens, alleging that there were nine drug pushers operating in the estate. That same month, Keating also told the Dáil about the “serious under-age drink problem” in O’Devaney Gardens. (The then-Minister for Justice Gerry Collins did not believe the allegations, saying there was “no evidence” of a serious drug problem or underage drinking). The public-private partnership (PPP) with Bernard McNamara – one of the most high-profile developers of Dublin city centre during the boom – seemed like the answer to all the problems. Instead, when the plans fell apart, residents were once again left in limbo with their future uncertain. Email “After more than 15 years, plans for O'Devaney Gardens officially scrapped”. Feedback on “After more than 15 years, plans for O'Devaney Gardens officially scrapped”.